"That '70s Show" is an American humoristic series which was created by Mark Brazill, Bonnie Turner and Terry Turner. This sitcom presents the everyday life, the first loves and the fooleries of six teenagers who live in an imaginary town called Point Place, Wisconsin. it is set in the seventies from May 17, 1976 to December 31, 1979. It was broadcast on the FOX TV network from 1998 to 2006. Eric Forman (Topher Grace) is the show's main character. He is a skinny teenager who is fond of Star Wars. His girlfriend and neighbour is Donna Pinciotti (Laura Prepon) and his best friend is Steven Hyde (Danny Masterson). The latter is paranoid, rebellious and a regular drug user who after his mother’s abandonment moved into the Forman’s basement. Then there is Michael Kelso (Ashton Kutcher), a dumb womanizer. And his girlfriend is Jackie Burkhart (Mila Kunis), a pretentious and hoity-toity high school cheerleader whose main concern is wealth and social status. Her relationship with Kelso is always on and off again, unlike Donna and Eric’s one. And last but not least Fez (Wilmer Valderrama), a foreign exchange student from a non-identified country. As his name is unpronounceable, he is nicknamed Fez, the acronym for Foreign Exchange Student. Other important characters include Eric's aggressive and bossy father, Red (Kurtwood Smith), who is a veteran of World War II and the Korean War. Eric’s mother hen Kitty (Debra Jo Rupp) is warm-hearted but also intrusive and likes the occasional drinking. She has to combine two jobs: housewife and nurse. The show also introduces Bob Pinciotti (Don Stark), Donna's stupid father. 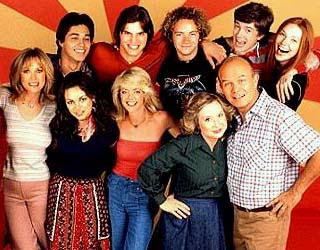 To sum it up, “That ‘70s show” is a very funny serial comedy, which is still very topical today, even though it is set in the seventies. This is obviously not to be taken seriously and it is inadvisable for humorless people. Here is an episode!